This sleepy trio of Christmas mice is safely tucked in bed and waiting for Santa. 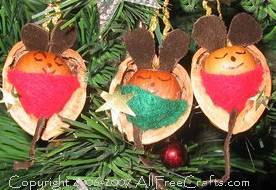 Make your own walnut mice ornaments from walnut shells, hazelnuts and little scraps of felt or fabric. 1. Clean out half a walnut shell and test fit a hazelnut to make sure it will sit snugly inside. 2. Glue a loop of gold cord to the inside top of the walnut as a hanger. 3. Cut two ear shapes from scraps of felt, suede or leather for each mouse, refering to our photo for details. Cut a thin tail from the same material. Glue the bottom of the ears inside the top of the walnut shell, in front of the gold cord. Glue the top of the tail inside the center bottom part of the shell. 4. Put a small amount of glue on the back of the hazelnut and set it inside the walnut shell. The top of the hazelnut should fit firmly against the bottom of the ears. 5. Cut a small half circle of felt or fabric as a miniature blankie; tuck the sides and bottom around the hazelnut mouse, working around the tail. Apply a small amount of glue to secure the blanket. If desired, add a small gold star to the side of the blanket. 6. Finally, draw a simple sleeping face on the mouse with black permanent marker. Allow the glue to dry, then hang your Christmas mouse on the Christmas tree.